Waking up early on Saturdays? 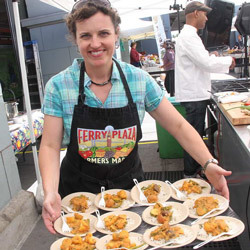 No problem for longtime Ferry Plaza Farmers Market patron-turned-volunteer Maggie Jacobberger, who regularly shows up at 8 am on Saturdays to support CUESA’s free cooking demonstrations. Passionate about inspiring people to cook with seasonal ingredients, she has also volunteered with CUESA’s Foodwise Kids program, hands-on kitchen skills classes, and special events since she started volunteering with us in July 2012. “I love working with Maggie because of her enthusiasm about learning new recipes and working with great chefs,” says CUESA Market Chef Elianna Friedman. “She’s also a great asset to CUESA because she brings her friends to volunteer with her and tells everyone she knows about CUESA’s mission to cultivate a healthy food system.” Meet Maggie. Maggie: My grandmother was an awesome cook and introduced me to the farmers market at a young age. She ignited my passion for cooking and using only the best and freshest local ingredients. Maggie: I am the founder and owner of Smart Cookie Learning. Our mission is to instill local middle and high school students with invaluable and intangible study skills that are essential to lifelong learning and academic success. These include: conscientiousness, grit, resilience, perseverance, and optimism. This startup keeps me pretty busy, but in my free time, I enjoy experimenting with new recipes, especially desserts, and exploring and hiking the incredible trails throughout the Bay Area. Maggie: It’s been an incredibly fun learning experience. The farmers, the visiting chefs, the CUESA staff, and my fellow volunteers have all taught me so much about sustainable agriculture and cooking. Maggie: The cherry tomatoes are incredible right now. I highly recommend Chef Joyce Goldstein’s recipe for Cherry Tomatoes in Cream. Market Chef Elianna Friedman and I ran into Chef Goldstein on a Saturday morning a few months ago. She shared this recipe with such enthusiasm and ended her description with a fist pump and leg kick! It’s experiences and exposure to expertise like this that make volunteering so enjoyable.